This weighted workout was actually a favorite at Fixed on Fitness this week. Yes, it was tough, but most people liked it. You can use the structure with any exercises, so this workout is easy to duplicate even if you don’t have access to a weight. You won’t need much room, so you can get this done pretty much anywhere. While this workout isn’t the most difficult workout you have likely done, soreness is pretty likely. The reps add up, so don’t plan to do this workout on the day before a workout that you need to perform well on or a run where you are looking to clock a personal best. Check out the weighted workout, Count Down By Two. This workout is split into two separate sets. You will complete all of the reps for the first set before moving to the next set. Each set is followed by 25 chest to floor burpees. You will start at reps of 20. 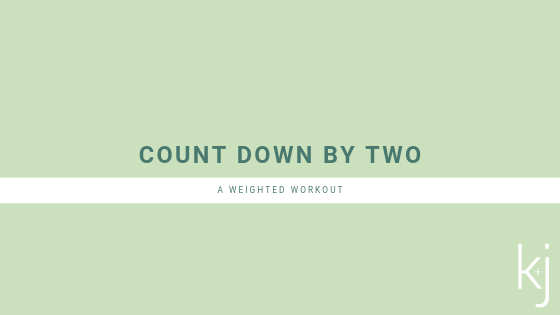 Then, count down by 2 reps each round. So, your reps = 20, 18, 16, 14, 12, 10, 8, 6, 4, 2. For the single arm exercises, perform half of the reps on each arm. For example, you will do 10 thrusters on your right arm and 10 thrusters on your left arm to equal 20 reps. Then, you will do 9 on the right and 9 on the left to equal 18. It’s time to put the excuses aside and just get this workout done. Exercise is good for your physical health, but it’s also great for your mental health. If you don’t have access to a weight, substitute any exercise into the structure. Push ups, mountain climbers, v ups, floor hops, burpees, squats, and lunges all work well. If you don’t want to create your own substitutions, check out our post about Travel Workouts. These are great workouts that you can do with no equipment and with minimal space. Do you need some accountability to get your workouts done? Check out our outdoor fitness program, Fixed on Fitness. Here, all the programming and workout design is already done for you. All you need to do is show up. Plus, there is a great community of people there to help encourage you and hold you accountable. Along with the community, you have a certified personal trainer ready to help guide you, challenge you, and provide any necessary modifications. You can try a week for free, no strings attached. Why not? Maybe you are looking for more than fitness, and you are ready for a full lifestyle change. For those looking to transform their health and wellness, we offer Project You. Enrollment for our spring course hasn’t opened yet, but you can get first access by jumping on our waitlist. I hope you enjoy this weighted workout. We are here for you. Contact us if we can help you.